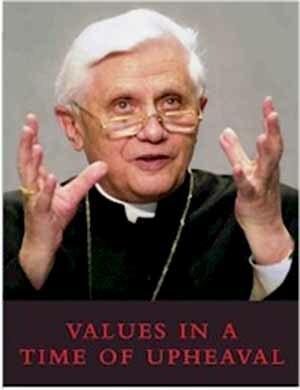 Then Joseph Cardinal Ratzinger in his book Values in a Time of Upheaval (Crossroad Publishing Co./ Ignatius Press, 2006) plays the political theorist. This book is not part of the Church’s Magisterium. We have commented on Cardinal Ratzinger’s phrase the “dictatorship of relativism” many times. And we’ll do so again. A “dictatorship of relativism” doesn’t compute. There can be a dictatorship of absolutism. There can be an anarchy of relativism, a democracy of relativism, a liberty of relativism. The destruction of Christian morality in the West is not the result of any dictator. It’s the result of a “democracy, liberty, and freedom of relativism.” Most democratic people support moral relativism or acquiesce to it. Or as Donald DeMarco said in the National Catholic Register (Aug. 6-12, 2006), Cardinal Ratzinger “has given some popular currency to the phrase 'the dictatorship relativism. 'The true relativist ... would have nothing to dictate to anyone.” Touché. In Cardinal Ratzinger’s Values in a Time of Upheaval, he muddies up his phrase; indeed, he reverses his position. He says, “The modem concept of democracy seems indissolubly linked to that of relativism.” Well, well! But then he backtracks: “This means that a basic element of truth, namely, ethical truth, is indispensable to democracy.” But then he backtracks again: “We do not want the State to impose one particular idea of the good on us. ... Truth is controversial, and the attempt to impose on all persons what one part of the citizenry holds to be true looks like enslavement of people’s consciences.” And he says this on the same page! What happened to a rightly formed conscience? The Catechism says, “Personal conscience and reason should not be set in opposition to the moral law or the Magisterium of the Church” (n. 2039), and “One must therefore work to correct the errors of moral conscience” (n. 1793).